"The Ox and the Birds" was awarded Honorable Mention by our panel of Stampede Judges. Congratulations! 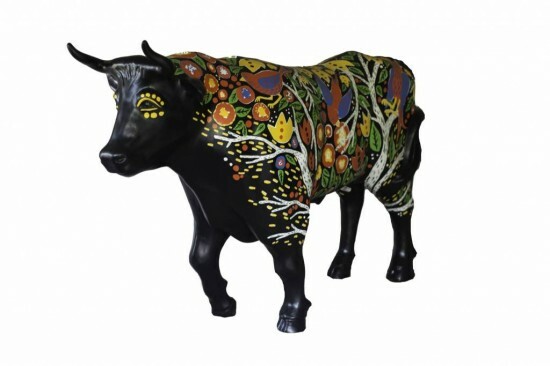 My inspiration for the ox came from a combination of Guatemalan and Russian folk art. My fiancé and his parents come from Russia. My mother is from Guatemala. In both of the houses, folk art decorates their homes. In Guatemalan Folk Art, there are a lot of repeating patterns and variations of color. Russian folk art tends to focus on six or seven colors, with reds and yellow popping out. The work that I’ve designed is more of a fusion of the two, with also a bit of contemporary feel. I take inspiration from folk art in my own artwork. So when asked to decorate the ox, I immediately had an idea of what to do. I imagined birds sitting on the back of the ox. Ox birds live in some parts of Africa. It is a tiny bird that rides the back of the wild yak and eats the bugs that pester the large creature. I don’t know if birds ride on the backs of American oxen, but if they did, I’d like to imagine that they are colorful and pretty. My imagination leads me to not only have the ox carry the birds, but to have the creature carry woods and flowers with it too. The artwork was painted with enamel and latex paint (the type of paint used to paint house walls) on the surface of the ox.